We came too close for comfort for this restaurant’s recipe. They asked us to remove their name from the recipe. 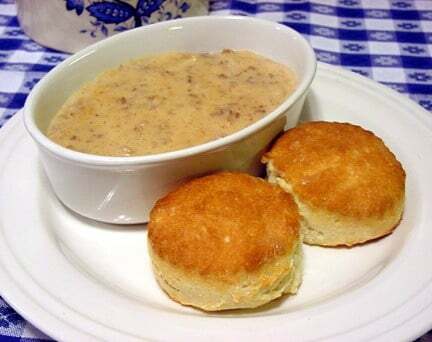 This sausage gravy tastes a lot like Bob Evan's Sausage gravy. On medium heat crumble sausage in fry pan, stirring often, cook sausage until brown. With slotted spoon remove sausage from fry pan and reserve pan drippings. The oil and drippings should measure 1/4 cup, a little vegetable oil may be added if needed. Cooking on medium low temperature add flour one tablespoon at a time and whisk. Stir constantly until flour thickens and turns light brown. When flour is thick and light brown add water slowly and stir. When flour mixture is smooth add milk, paprika, and salt, stir until blended. You want to let gravy simmer, but not boil this will curdle the milk. When blended add sausage, mix and simmer until heated through. I agree with Mrbeerz—NO water 4 cups of whole milk.I also have made it using 3 cups whole milk and 1 cup evaporated milk.This makes it more like my grandmothers as she used pure cows milk from her farm.So good with homemade country sausage and homemade biscuits. Water???? Skip the water and use 4cups whole milk. Trust me… my grandma perfected it. I have never had any luck with Gravy but for once it came out really good! Thanks for the recipe!